The Episode starts with Varun asking Lakbeer to click his pics with Soham. Lakbeer clicks their pics with Soumya and Harman. Varun sings kya kehna….to upset Harman and Soumya. He thanks Inspector and says I want to thank my ex family. He takes Lakbeer and Sukha with him. Harman hugs Soumya. Preeto is taking off evil eye from Soham and the house and burning something. Harak Singh coughs. Soumya comes to Harman and wakes him up to search diaper. Harman says diaper…Soumya asks him to be quiet and says he slept just now. Harman goes far and says I gave diaper to you. Soumya says it is not with me and asks him to come with her. Harak Singh brings more chillies to burn it. Preeto says she has already burnt it. Harak Singh says it is from my side. 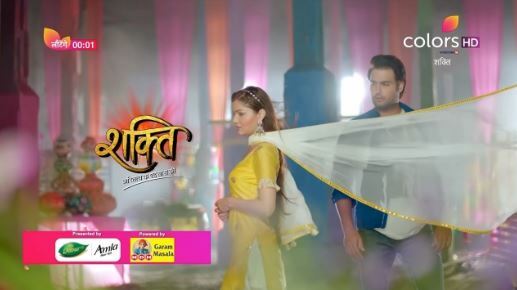 Harman and Soumya come there fighting for diaper. Harak Singh asks them not to fight and asks Veeran to search it. They all search diaper. Harman smiles. Harak Singh lie down and check under the sofa. Preeto laughs. Soumya and Harman smiles. Harak Singh asks why are you laughing and says I thought it is under the sofa. Preeto asks if it is found. Harak Singh says it will be found. Veeran and Shanno are upset. Harman hugs Harak Singh and says you are first Dada to search diaper like this. Shanno tells Veeran that they all have shaken their hands, I will be there as their servant. In the morning, Soumya wakes up and takes the baby. She says good morning. Varun looks at the pic and tells that his heart is burning seeing the pics. He asks what will happen with these pics. Harman wakes up and asks Soumya to give tea. Soumya says she will give tea to everyone after giving bath to Soham. Preeto asks Veeran to take care in factory. Soumya comes and sneezes. Preeto asks her to make ginger tea for everyone. Harak Singh tells Preeto that Soumya is having cold so she shall not make tea, and says if she is unwell then how she will take care of the baby. Preeto says Harak Singh’s bahu is unwell so she will not make tea, and asks Harman to call doctor and get her treated. Harman also teases Harak Singh. Saya calls Harman and tells that they want to see Soham. Harman tells that they will bring Soham to their house. Saya says no and asks him to bring him out. They come out and make Saya and others see Soham. Saya and others give him many gifts. Harak Singh keeps eye on them for Soham’s safety and smiles. Saya blesses them. Preeto asks Raavi about Harak Singh. Raavi says he has gone out and asks her to give him sometime. Preeto says he is worried for Soumya because of Soham and says now their family seems to be complete. Raavi says she is making halwa puri to celebrate Harak Singh’s care for Soumya. Preeto says then I will also make Pulao and says everyone of us love and care for each other. She says evil eyes shall be ward off. Veeran hears them and thinks Varun, Maninder and Sukha will not keep quiet and we shall be alert. Harman asks Soumya to sit and says I will bring bag for these gifts. He asks her to take care of Soham and herself. Harak Singh looks at them.